Visible, sustained support from executive leadership and commitment to the business process reengineering project. Use of proven business process reengineering methodologies that have solid grounding in real-world results - not just in theory. 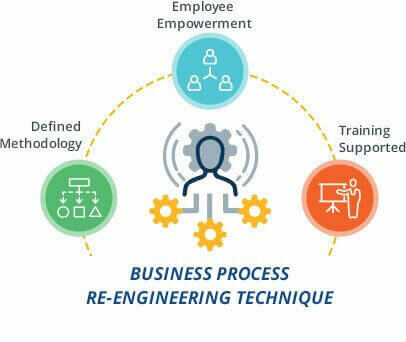 Clear communication within the organization, including documentation, which conveys the goals of the business process reengineering initiative as well as the roles and responsibilities of the participants. An end-to-end perspective that takes into account the entire process, and involves multiple parts of a company that may play roles in elements of its execution. Identification and attainment of "quick wins" that can help to build early confidence in the business process improvement initiative. Cinfy is a leading global strategic advisory company and the right partner for your business process reengineering program. Our business process expertise spans all major business operations including Finance, HR, IT, and Procurement. We can deliver end-to-end solutions for all of your business process reengineering needs. We offer superior solutions for critical business needs such as cost optimization, shared services, working capital management, globalization and outsourcing, IT strategy, supply chain consulting, and more. To learn how Cinfy defines and enables world-class performance, contact us.